Enviado el: lunes, 02 de agosto de 2010 11:33 p.m.
Enviado el: viernes, 06 de agosto de 2010 11:47 p.m.
Find attached copy of claims information and act accordingly. Claims Representative and Legal Representative. How are you doing today? I am in receipt of your mail and I must say that you should count yourself extremely lucky to have emerged as one of our winners in this New year BMW CAR INTERNATIONAL PROMOTION PROGRAM held in Berkshire, United Kingdom. The selection process was carried out through random selection in our Computerized Email Selection System (C.E.S.S.) from a database of over million email addresses. And your email address was randomly selected along with others from a database of over million email addresses drawn from all the continents of the world. Each email address was attached to a Ticket number and Secret pin code. 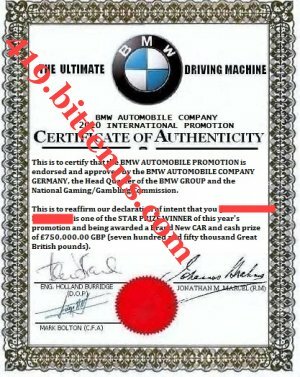 Your email address with Reference Number BMW: 25513500DS was selected along with others as winners of cash prize of £, 750,000.00 GBP (seven hundred and fifty thousand Great British pounds) and a brand new BMW 2009 X635iM (2009 modern). A certificate of prize claims and some vital documents will be sent along side your winnings Bank Draft and brand new BMW car. SCARLET COURIER CARGO DELIVERY INT. LTD, UK., has been contracted as your delivery agent to send your winnings safely to you. Contact their delivery Agent with the contact information below for further instructions on how to send your winnings to you. SCARLET COURIER CARGO DELIVERY INT. LTD, UK. DELIVERY OFFICER: Mr. Gary Smith Jr. Please you are to provide him with the above listed details as soon as possible so he can make verifications and finalize the processing of your prize winnings. It is imperative that you add your Reference Number BMW: 25513500DS as the subject of any correspondence with the courier company to ensure they respond in a timely manner. Finally, all winnings and winning information should be kept strictly confidential (Secrete)and third parties are not allow in the claim of prize this is part of our security measures to avoid double claims , imposters and misappropriation of funds. Enviado el: domingo, 08 de agosto de 2010 02:13 p.m.
Berkshire SL1 4BG, United Kingdom. You are welcome to Scarlet Courier LTD Dispatch UNIT an affiliate of the BMW ONLINE LOTTERY. We are pleased to be at your service. Scarlet Courier is regulated and Stipulated by the Financial Service Authority (FSA), the financial institutions that govern all financial activities in the United Kingdom. This office has been Notified by the BMW ONLINE LOTTERY BOARD of the prize won with their 2010 BMW PROMOTION in the amount of £750,000 Pounds and a brand new BMW X6 series Car. This means that you have been officially cleared for payment by the Verifications Dept at the headquarters of the BMW LOTTERY DEPARTMENT. 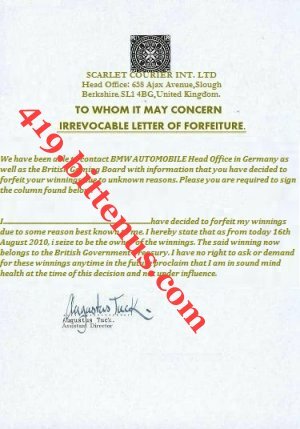 The original copy of your winning certificate, car, together with a covering document (Money Laundering protection and Letter of Affidavit for Claims) from the British government stating that the money was obtained legally through the 2010 BMW PROMOTION will be sent to you as soon as you choose from any of the option stipulated below. Very Important Notice: The Delivery Charges cannot be deducted from your winnings, and also the Delivery charges are to be paid by you. This is in accordance with section 13(1) (n) of the National Gambling Act as adopted in 1993 and amended on 3RD July 1996 by the constitutional assembly. This is to protect winners and to avoid misappropriation of funds and win Situations. Please respond to this email by making a selection from the three options above. Send your response to indicate your option within the next 24hrs, so that delivery of your prize to your residence can be made immediately without delay. © 2010 Scarlet Courier LTD.
Enviado el: lunes, 09 de agosto de 2010 09:26 a.m.
You are to make payment of £490.00GBP which is equivalent to $879.655USD for the chosen option via WESTERN UNION MONEY TRANSFER Only to speed up the process of the transfer.You are to locate the nearest WESTERN UNION MONEY Transfer agent nearest to you and make the payment through the name of our broker in our head office. RECEIVER’S ADDRESS: 658 Ajax Avenue, Slough Berkshire, United Kingdom. More so,immediately payment is confirmed by our account's officer,your package will be delivered to the address you have provided.We shall inform you when to expect our dispatch agent that will be sent to you, and you will also be required to show to him your National I.D card for proper verification.Note you are advice to keep your winnings confidential to avoid double claims. Enviado el: viernes, 13 de agosto de 2010 02:01 a.m.
Enviado el: lunes, 16 de agosto de 2010 12:38 a.m.
With regards to our management last email on your winnings delivery, we are yet to receive any response from you. 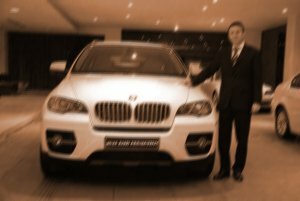 we got a Fax message from BMW AUTOMOBILE informing us that it has come to their notice that you are no longer ready to receive your BMW AUTOMOBILE winnings. This fact they informed was confirmed by your continuous negligence in complying with remitting your courier charges payment to enable us insure your winnings for delivery to commence to you. We do believe you know what you are doing, because you are about to lose a huge sum of money and a brand new car. Well we believe you know what you are doing to yourself. Do take your time to review the document attached to this email, sign and forward back to us and your winning delivery would be terminated and redirected back to the British Treasury.